Since our daughter is too small to go my parent’s house which is bit far away from where we live, we went to my wife’s parent’s house for our new year’s holidays. We spent most of the time in Kobe during the holidays, we were walking around the town everyday more than ever. Nice and comfortable town always fascinate us and there is always some discovery. The town of Kobe is exactly a kind of them. The picture is an exhibition of the colaboration of water painting by Hiroshige Kagawa and classical musics. 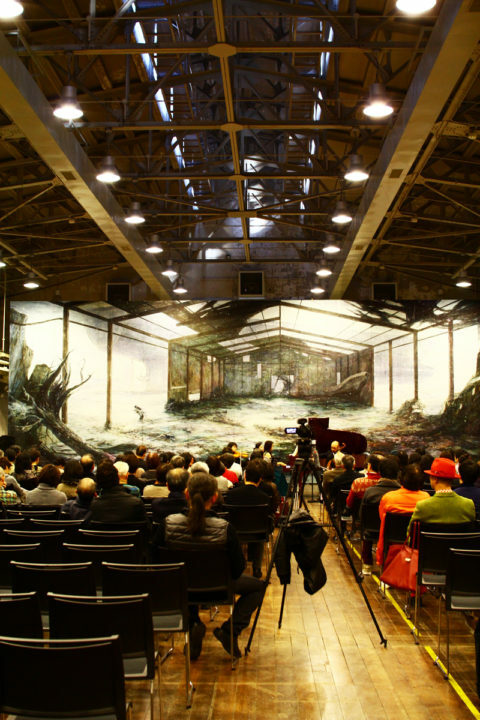 The water painting was just like a IMAX theater that is painted on entire wall. It made me feel like behind the stage is became ruin by tsunami and the contrast of “this side” enjoying music and “that side” was making beautiful atmosphere somehow. We often encounter such events when we walking at Kobe. When we move and see something and see somebody creates some heat just like a friction heat. We wish we can create such heat lot this year. So probably three of us will visit you suddenly but we wish you’ll welcome us warmly! Photo: The exhibition at Design and creative center Kobe.